On Aug. 15, a wallet and a Lincoln MKZ were reported stolen from separate houses in a Paso Robles neighborhood. The stolen wallet belonged to Paso Robles resident Mark Kennedy. Kennedy’s wallet was stolen from his unlocked car parked in his driveway and later found in nearby bushes. But all of Kennedy’s credit cards had been stolen, and the next day, one of the cards was used to make an online purchase at Walmart, Kennedy said. Investigators believed whoever stole the credit cards was also responsible for the vehicle theft. However, Walmart refused to disclose information about the purchase to police. Investigators had asked Walmart to provide them the address to which the purchased items were being shipped. Kennedy called Walmart, and a representative of the store acknowledged the purchase was fraudulent, but said Walmart could not provide him an address unless he gave them the username and password for the online account used to make the purchase, Kennedy said. Paso Robles Police Commander Steve Lampe said Walmart often does not provide his department with information unless officers have a warrant. Lampe said other larger stores and banks do the same and that the decision is made much higher up than the employees with whom police are communicating. 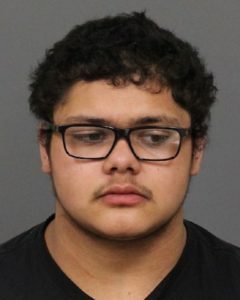 Nonetheless, on Aug. 24, officers arrested Ricardo Angel Ramirez, 18, of Paso Robles on charges including three counts of felony auto theft and three counts of burglary. Police believe Ramirez is responsible for the stolen credit cards and Lincoln MKZ. Prior to the arrest, detectives served a warrant at Ramirez’s home and found items linking the teen to two additional auto thefts and multiple burglary or theft cases in Paso Robles, police said. Ramirez currently remains in SLO County Jail with his bail set at $100,000. Kad Walmart been willing to cooperate, police may have tracked down the suspect sooner, Kennedy said. So here is a likely suspect for the no bail system the libs want to push, if let out on no bail, he most likely will go hide. Wow! The “Minority Report” has spoken! Got any good tips on the horses? How ’bout the World Series, or Super Bowl? Surprised? No, really, are any of you? With Walmart’s decades old record of holding up and or killing small business throughout this country? All the while their average pay is minimum wage, only part time hours and no benefits, and you’re working for a company with a gestpo management style (bonus driven border-line psychosis), why wouldn’t they do this? Somehow, if someone took the time and dug far enough, they’d probably find this somehow negatively effects the bottom line of their P&L, as money is the only thing that motivates Sam’s heirs. Who leaves their wallet in an unlocked car?